Is Wearable Technology (such as Google Glass) the Future? To keep up with technology, you need to keep up with the different formats it comes in. The last big thing was wireless devices. 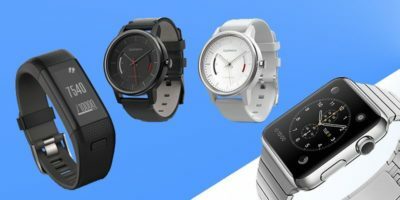 The newest idea to be coming out very soon in different formats is wearable technology, such as smartwatches and Google Glass. Will you be catching the wave of this technology and getting one of these items? You can’t deny that wearable technology has the “cool factor.” Google Glass resembles a headband or a pair of eyeglasses and works like any mobile device. It has a camera, a touchpad, and connects through the Internet. The “display” is within your vision in front of you. 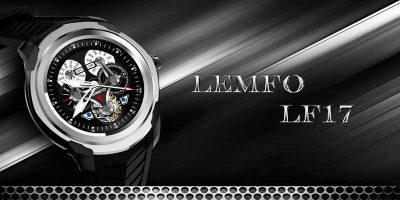 Smartwatches are being developed by several different companies including Apple, Google, Microsoft, and Blackberry. These devices are all expected to have different capabilities. While some will function independently as mini devices, others will connect back to your smartphone. 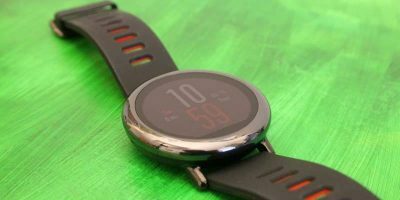 The smartwatch you would opt for would depend on what functions you’re looking for from a watch, assuming you’re looking for something more than just knowing what time it is. Do you think wearable technology is the future? Let us know your thoughts in the poll below. 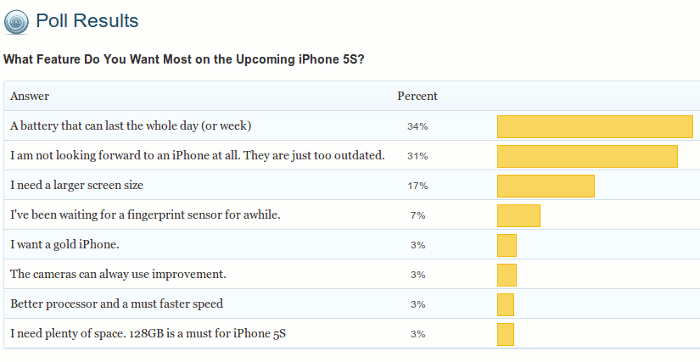 A third of those responding are looking most forward to the iPhone 5S because they’re looking for a smartphone that has a battery that can last the whole day and maybe even a week. Slightly less of the responders aren’t even looking forward to the newest iPhone as they think Apple’s smartphone has become too outdated. Sixteen percent want an iPhone with a larger screen size. None of the other expected features, such as a fingerprint sensor, improved camera, better processor, more space, or a gold color garnered much interest at all. Wearable tech has been invented. It will be marketed. People will get it just for the bragging rights “Look how kewl I am!! !” It is inevitable. However, wearble tech such as Google Glass will make living in a totalitarian state seem like vacation. If you think NSA surveillance is bad now, just think of what that busybody watching everybody from behind her curtains can accomplish with her very own Google Glass.